Join Capital Machine’s Southwest Sales Engineers for HOUSTEX February 26 – 28, 2019 at the George R. Brown Convention Center in Houston, Texas. 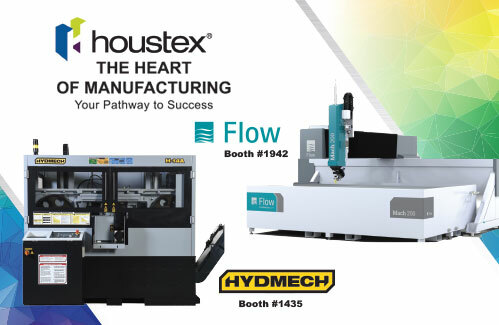 Capital will be onsite supporting both FLOW at booth #1942, and HYDMECH at booth #1435. FLOW will be showcasing the latest in waterjet technology, the Mach 200 3020 (6.5’ x 10’ cutting travel) Pivot Plus 2D / 3D cutting head, 30HP Intensifier 60,000 PSI pump. HYDMECH will have the H14A, H-Series are double-column saws ideal for solid production cutting, S23A, S-Series are mitering bandsaws for medium capacity and a DM12/15, D-Series are double miter band saws that provide exceptional cutting capability, will be on demo. Experience more than 65,000 square feet of the latest in advanced technologies and processes that help manufacturers innovate and create industry transformation. HOUSTEX features hundreds of exhibits, from additive manufacturing to robotics, machining centers to welding, and dozens of technologies in between. Reach out to your local Sales Engineer to set up a time to have all your waterjet and sawing needs answered. See you at the show!